Whether it’s cold or warm outside my back door, one constant around the bird feeders are the irrepressible squirrels. They never give up. They stick with their DNA-imbued mission. Nothing we people can do mutes or trumps their drive to do what a squirrel’s got to do. I watched a couple of combatants battling for the best of my sunflower seeds on my porch this morning, when it suddenly occurred that I was seeing a life lesson. And I realized that marketers could take more than a few cues from these industrious critters. Lesson one: Protect Your Nuts. You have assets, values, ideas that represent the foundation of what you do well. Like the determined creatures out back, you must identify and seize upon those core values that make you and your company authentic, valuable, irreplaceable, and you’ve got to fight to keep those things. That takes determination, identification, constancy and realization … and the will to work hard to protect and tout those essential assets if you expect to survive another year. Lesson two: Find and Discover New Nuts. Its brain is smaller than yours … a lot smaller and a lot less sophisticated … but every squirrel understands that it will never survive by being satisfied with the nuts it knows. Discovery is part of the survival business of being a squirrel and it should be yours, too. A great PR partner can help your business discover what you may not find on your own. Lesson three: Never Assume the Old Storehouse Will Still be There. Squirrels thrive on urgency. So should you. Like that birdseed thief on your patio, you’ve got to move fast, with constancy, to find new opportunities. Some opportunities will feed your business for a while, but none lasts forever. We’re schooled in John Kotter’s Harvard Business School research on the need for what’s called a burning platform beneath you. Urgency fuels continual investment to feed your future. It’s prerequisite to your success, today and for as many tomorrows as you still have. The right strategic communication tools institutionalize urgency and help you to prosper. Lesson four: Climb and Stretch Without Fear. Squirrels take measured, successful risks. They’re unafraid of stretching the boundaries of what they’ve done in the past. Their athleticism at making good on their mission carries a lesson for all of us. We need to be more fearless about discovering new things. 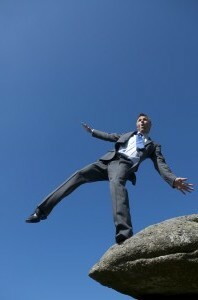 We should all be as willing to take leaps of faith in ourselves, challenge old assumptions and processes. Again, the right PR partner (Quicksilver Edge) can help you identify those moments and opportunities. With the right partner you can leap without fear. Lesson Five: Make Noise and Proudly Wave Your Tail. Success breeds success, both internally and external to your organization. No one will notice your success or your worth unless you take pains to signal what you are and what you bring to your business environment. Squirrels are irrepressible. You ought to be irrepressible too. But when your forte is, in essence, nut supply and multiplication, it doesn’t make you an expert in all the other aspects of success — like marketing, publicity, reputation, respect and trust. Squirrels do it all. You can’t. Let us help. Sitting on your nuts today won’t grow you an oak grove tomorrow. We can help you locate new opportunities, act with urgency, help you stretch your capabilities and let the world know that you’re a serious asset that’ll be around for a long time to come. Just like those little guys in your back yard. One of the most frustrating aspects of democracy is that there’s no requirement to do research before casting a vote. I could spend hours studying candidates’ positions, histories and promises only to have my vote cancelled out by someone who picked their guy by the signs on their neighbor’s lawn. Yet any solution to this would in itself be undemocratic; quizzing voters at the booths, giving weight to votes based on education or otherwise hindering uninformed voting would skew representation toward the educated middle class and away from those who need it most.